I'm Going to Catch My Tail by Jimbo Matison. Review: Have you ever seen you cat run around and try to catch his tail? Then you will love I'm Going to Catch My Tail. 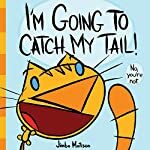 I'm Going to Catch My Tail by Jimbo Matison is a hilarious picture book about a cat that wants to catch his tail. The cat has a bad dream and so his tail wakes him up. Then the cat wants to catch his tail, he goes under the blankets, through mountains of toilet paper, and into a laundry basket but cat still can't catch his tail. What will this poor cat need to do to catch his tail? I'm Going to Catch My Tail is a great book for 3-7 year olds. Little kids will love this book and they may even want to have their own cat. In I'm Going to Catch my Tail Jimbo Matison has written a great has engaging illustrations and a fun story line that preschool kids will want to read them over and over again. We would like to thank Abrams Books for providing a copy of I'm Going to Catch My Tail for this review. Have you read I'm Going to Catch My Tail? How would you rate it?